The Progressive Conservative government's first throne speech sets the bar high but has few new promises beyond those the party made during Manitoba's provincial election. The new government says its mandate and future course is clear: "Committed to making Manitoba the most improved province in all of Canada." "We want there to be measurements so we can be held accountable," said Premier Brian Pallister, who wants progress reports to chart how the government is doing. However, some of the improvement will be harder to measure, such as how many potholes get filled or who's looking for daycare for their kids, Pallister said. The throne speech is essentially a recital of what the PCs promised during the election to accomplish in the new government's first 100 days in office, with a smattering of broader campaign pledges thrown in for good measure. There is a broad new promise to find a made-in-Manitoba climate action plan, including carbon pricing to foster emission reductions. However, Pallister offered little detail on those plans, saying he "wasn't about to brainstorm today about that." Manitoba's new Minister of Sustainable Development Cathy Cox had few details to offer on the government's plan for climate change as well. When asked whether carbon pricing means Manitobans will be facing a gas tax, the minister said, "Well, I think that remains to be seen. We want to work with stakeholders ... and determine the best Manitoba-made action plan for climate change." She said climate change is a real problem. "It's important that we preserve, you know, our natural resources, [and] our climate of course is of the utmost importance. I think in this portfolio you don't get a second chance so we want to do it right." The plans outlined in the throne speech also include a value-for-money audit across all government departments aimed at cutting $50 million in bureaucracy; a commission to reduce red tape in government; building relations with Manitoba's Indigenous people; reducing hospital wait times; and joining the New West Partnership Trade Agreement with other western provinces. As well, a premier's enterprise team made of business leaders will look for ways to grow the economy. On the labour front, the PCs promise legislation requiring a secret ballot vote in workplaces considering unionizing. There is also a promise to ensure provincial byelections are called within six months of a seat becoming vacant as well as a promise to eliminate a subsidy that has given hundreds of thousands of dollars each year to political parties. The PCs also promise to introduce the Protecting Children Act, which will allow stakeholders such as police and community agencies to share information when dealing with at-risk children. Promises to improve literacy programs at schools, boost tourism marketing and bring in legislation to have referendums on major tax increases were also included in the speech. Pallister said more of his government's agenda will be clearer in the next week or so as it sends mandate letters to various departments and stakeholders. After winning last month's election, Pallister says he wants to start turning the province's finances around, but says it will take time because the N-D-P deficit was high. 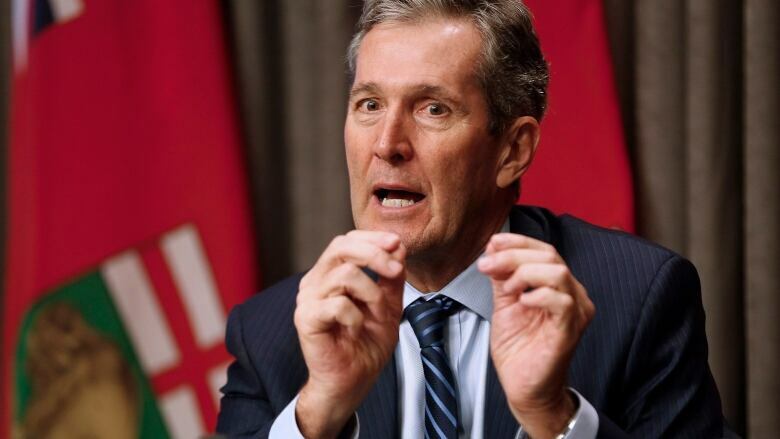 The former government estimated the deficit at $773 million, but Pallister says it has risen and an updated number will be released on Wednesday. The provincial budget is slated for May 31.